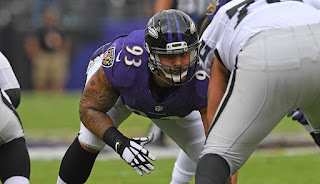 Defensive tackle Lawrence Guy has been a part of four NFL teams early in his career, including the Green Bay Packers, Indianapolis Colts, San Diego Chargers and Baltimore Ravens. But it was with the Ravens that he had the biggest impact – both with the team and head coach John Harbaugh. During the AFC coaches breakfast at the NFL owners’ meetings in Phoenix on Tuesday, Harbaugh spoke about his former player and how he believes he’ll fit right in in New England. The 27-year-old signed a four-year, $20 million contract with the New England Patriots earlier this month. In Guy’s three seasons with the Ravens, he totaled 90 tackles, 5.5 sacks, two pass deflections and one forced fumble.